Super Nintendo Entertainment System (SNES) was a 16-bit home video game console developed by Nintendo that was released in 1990 in Japan and South Korea. In Japan, the system was called the Super Famicom (officially adopting the abbreviated name of its predecessor, the Famicom), or SFC for short. In South Korea, it was known as the Super Comboy and was distributed by Hyundai Electronics. Although each version was essentially the same, several forms of regional lockout prevent the different versions from being compatible with one another. The SNES was Nintendo's second home console, following the Nintendo Entertainment System (NES). The console introduced advanced graphics and sound capabilities compared with other consoles at the time. The development of a variety of enhancement chips integrated in game cartridges helped to keep it competitive in the marketplace. The SNES was a global success, becoming the best-selling console of the 16-bit era despite its relatively late start and the fierce competition it faced in North America and Europe from Sega's Genesis/Mega Drive console. The SNES remained popular well into the 32-bit era, and continues to be popular among fans, collectors, retro gamers, and emulation enthusiasts, some of whom still make homebrew ROM images. Designed by Masayuki Uemura, the designer of the original Famicom, the Super Famicom was released in Japan on Wednesday, November 21, 1990 for 25,000 yen ($210). It was an instant success; Nintendo's initial shipment of 300,000 units sold out within hours, and the resulting social disturbance led the Japanese government to ask video game manufacturers to schedule future console releases on weekends. The system's release also gained the attention of the Yakuza, leading to a decision to ship the devices at night to avoid robbery. Nintendo released the Super Nintendo Entertainment System, a redesigned version of the Super Famicom, in North America for $199. It began shipping in limited quantities on August 23, 1991, with an official nationwide release date of September 9, 1991. The SNES was released in the United Kingdom and Ireland in April 1992 for £150, with a German release following a few weeks later. The rivalry between Nintendo and Sega resulted in what has been described as one of the most notable console wars in video game history, in which Sega positioned the Genesis as the 'cool' console, with more mature titles aimed at older gamers, and edgy advertisements that occasionally attacked the competition. Nintendo however, scored an early public relations advantage by securing the first console conversion of Capcom's arcade classic Street Fighter II for SNES, which took over a year to make the transition to the Genesis. Despite the Genesis's head start, much larger library of games, and lower price point, the Genesis only represented an estimated 60% of the American 16-bit console market in June 1992, and neither console could maintain a definitive lead for several years. Nintendo continued to carefully review submitted titles, giving them scores using a 40-point scale and allocating Nintendo's marketing resources accordingly. Each region performed separate evaluations. 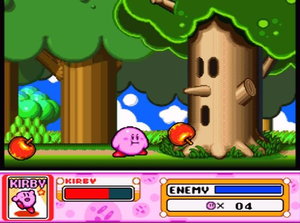 Nintendo of America also maintained a policy that, among other things, limited the amount of violence in the games on its systems. One game, Mortal Kombat, would challenge this policy. A surprise hit in arcades in 1992, Mortal Kombat features splashes of blood and finishing moves that often depict one character dismembering the other. 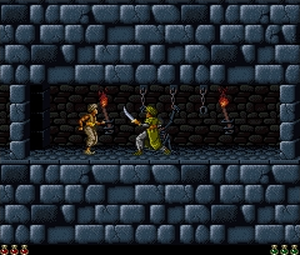 Because the Genesis version retained the gore while the SNES version did not, it outsold the SNES version by a ratio of three or four-to-one. Game players were not the only ones to notice the violence in this game; U.S. Senators Herb Kohl and Joe Lieberman convened a Congressional hearing on December 9, 1993 to investigate the marketing of violent video games to children. While Nintendo took the high ground with moderate success, the hearings led to the creation of the Interactive Digital Software Association and the Entertainment Software Rating Board, and the inclusion of ratings on all video games. With these ratings in place, Nintendo decided its censorship policies were no longer needed. All information in this article are taken from Wikipedia:	http://wikipedia.org/. 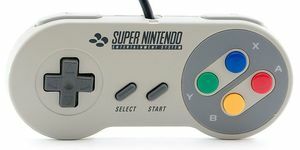 Gamepad for the European and Australian versions of the SNES. It contained cross-shaped joypad, 6 action buttons A, B, X, Y, L and R and the 2 functional buttons Select and Start.